When we meet her, Auma is a 13-year-old girl growing up in the Kenyan village Koromo. She is a brilliant student and fast runner and hoping to use her track skills to earn a scholarship to continue her education beyond primary school. She wants to be a doctor. Her dream becomes more urgent and less likely when people in her village begin rapidly dying off of a strange illness known colloquially as "Slim," not that they even call it by that name very much. "Slim" is AIDS. It strikes parents and babies leaving behind a sea of orphans and grandparents with little means to get by. 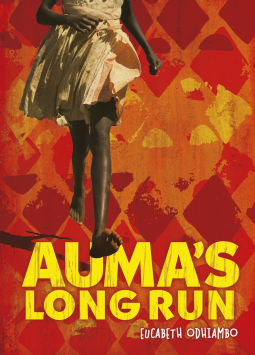 Auma's story is complex and unpredictable, things I don't expect from middle grades fiction, though I should given that this is the second such MG book I've read in this week. I was surprised, but shouldn't have been, by the maturity of Auma's thoughts, how she parses scraps of infomation and reads the adults around her.